The Annual Status of the Education Report (ASER) survey is a unique activity for many reasons. Every year, with the help of more than 25,000 volunteers, ASER assesses the basic reading and arithmetic skills of more than 6,00,000 children in the age group of 5-16 years — more than the twice the National Sample Survey’s (NSS) rural sample — from approximately 16,000 villages in 560 districts of India. To learn more about this astounding exercise we spoke to Mr Ranajit Bhattacharyya, who is the General Manager of the ASER Centre. enrollments and learning achievements are not quite correlated. While working on the problem of lack of quality education and low levels of learning in schools, they realized that early reading is a critical factor. For their work, they had to define what the basic minimum level of learning is for a child. That’s how the ASER tools were first conceived, based on Pratham’s field experiences. Pratham’s early model of measuring reading levels by simple assessments spread to other parts of the country and the results generated internally were frightening. They found that most of the Class-5 students weren’t even able to read Class-2 books. They tried to compare their data with other sources of secondary data but they couldn’t find any secondary data on learning outcomes. In early 2005, they decided to do a rapid pilot assessment survey in more than 16 blocks across 8 states, and a similar pattern emerged. When they presented this data to the planning commission, given the dearth of hard evidence for policymaking, the deputy chairman Mr Montek Singh Ahluwalia strongly encouraged them to do this assessment across the country. So, in 2005, the first nationwide ASER survey was conducted. In a decade’s time, ASER has established itself as an authoritative reference on primary school learning outcomes. Household-based assessment – so as to include all children, whether school-going or dropouts. Sample size – approximately 30 villages in each district, and 20 households in each village. This means they have a sample of 600 households in each district, and more than 3,00,000 households at the national level. Simple and effective assessment tools – these tools are so foundational that even you can conduct an ASER assessment. Driven by more than 25,000 volunteers, who are trained by over 1,000 master trainers. In the last decade, they have partnered with over 2,000 organizations. They prefer educational institutes including colleges and DIETs (District Institutes of Education and Training), but they also partner with NGOs, government, and private organizations. 243 DIETs participated in the data collection of ASER 2014. 60% of all the responses are rechecked and verified through different processes. District, state, and national level estimates – to facilitate local level discussions, planning and action. In the Indian social sector, where good quality data collection is still a major challenge, ASER’s leading approaches of community mobilization and logistical management are well worth understanding. The ASER volunteers are trained at the district level by respective master trainers. The training lasts for two to three days, at the end of which volunteers have to take a quiz. Only those who perform well in the quiz are selected. The master trainers themselves are trained over 5 to 6 days at state level by the core ASER state team members, who in turn undergo a rigorous training at the national level prior to the state trainings, which also lasts 6 days. For each village, ASER pairs two volunteers on the basis of their performance. They are given a village pack which contains “all the tools, formats, instructions, and communications materials to be used in the village”. The survey in a village is conducted over two days – normally Saturday and Sunday. On day one the volunteers visit the village schools to collect school information, talk to people and map the village. They then divide the village into four sections or hamlets and use their “5th household rule” to sample 20 households – five from each of the four divisions or hamlets. They collect basic information from each household and assess the reading and arithmetic skills of children belonging to the target age group of 5-16 in that household. This data collection process is monitored by the master trainers and more than 50% of the entire responses are rechecked using different methods. After verification, the data comes to the central team which analyses it to produce the ASER report, which has had a notable impact on our education policy. The ASER data collection model is a perfect example of how community engagement and simple tools can contribute towards data-driven systems. This is a part of our ‘Data Ecosystem’ series, an effort to highlight organizations and nonprofits leading the curve of evolution towards data-driven decision making. To get an insight into the ASER tools and data quality frameworks refer to Part 2 of this post here. 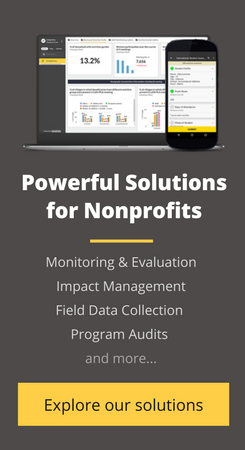 Over 150 organizations across 7 countries use our mobile-based data collection tool Collect to monitor and track data on a real-time basis.